Gardening under or near Norway Maples always requires some planning or, when it comes to dealing with clients who want to do this, "managing expectations." When even weeds are reluctant to grow in these dry and shady spots, you know that some challenges await. 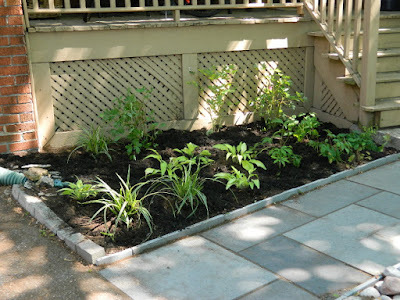 Jennifer, my client in this post, has had enough of this front bed and who can blame her? I won't comment on the rock placement (ahem) but the three boxwoods are ailing in this dry bed about 50 feet away from the maple's trunk. Even at this distance, the maple's shallow roots are greedily taking in as much moisture as it can. 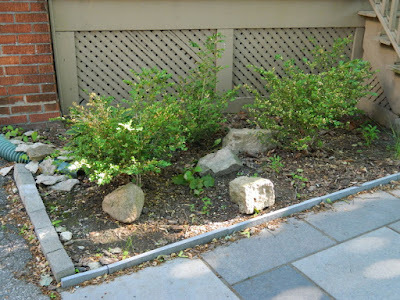 The boxwoods, like many across Toronto, are afflicted with their most serious pest, the Boxwood leafminer and have never been pruned so I'll take them out of their misery. I chose shade-tolerant perennials like bleeding heart, barrenwort, Carex, hostas and hellebores. These shady characters are very common and easy to find at most garden centers. The maple will always compete for moisture and nutrients with the new perennials but the client was willing to "give it a shot" and promised me to regularly water this bed. No, I didn't bother putting the boulders back into this bed since they were too small to have any significant visual interest. This was a cute little project although, for me, a challenge was digging through the "rooty" soil.The shallow maple surface roots were more of a nuisance than an outright obstacle luckily.